Perfect opportunity to buy into an International Furnishings retail concept at a great price. 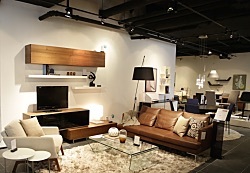 This Modern Furniture store is well located in a desirable design retail area in Toronto. The store is 4,590 square feet and consists of several furniture studios, and boasts annual sales of just under $2 Million. The furniture studios inspire clients how to best optimize and style their space whether they are furnishing a large house or a condo. This is the ideal opportunity for a new franchisee with a passion for design to develop the store to its full potential. With the right business plan in place and a strong support team, all you need to bring to the table is a good business sense, hard work and the ambition to become part of a successful chain. This store enjoys a very positive reputation and a high percentage of the business comes from repeat clients. Key relationships and partnerships established expose this business to a key target market with very positive results to date. All training and support will be provided by the franchisor. This store is part of an international retail concept providing a coordinated and customized product range of design furniture and accessories. The brand is uniquely positioned in the market as “affordable luxury” making affordable modern design furniture available to the urban-­-minded shopper, and to ensure that our customers receive a unique shopping experience and individualized furniture solution for their homes.